Designed to contour a moms natural shape, our loving moments wire free padded nursing bra is the perfect addition to your breastfeeding wardrobe! as a charming t-shirt bra, its back closure offers complete adjustability while the easy one-hand nursing clasps allow mom the luxury of breastfeeding simplicity. Smooth and black, the extra soft material will always lay flat beneath tops and blouses. Additionally, the flirty lace neckline and matching bow are a charming touch of feminine style. The Great Expectations Maternity Nursing Racerback Sports Bra is comfortable and stylish. This bra offers a Fit to Flatter look while giving a comfortable feel. This Playtex Nursing Camisole has a built-in bra and flexes to fit as your size changes. Comfortable through pregnancy and while nursing. Higher sides for better coverage and wider straps that won’t dig. 95% cotton and 5% spandex, breathable, soft and comfortable, suitable for all year round wear. 4 rows of hook & eye back closure help to reduce the pressure of shoulder. Front opening button for convenient breastfeeding. Wire-free and widened shoulder straps offer a more comfortable feeling. Healthy and gentle to skin, suitable for pregnant women or nursing moms. The Great Expectations Maternity Nursing T-Shirt Bra is comfortable and stylish. This bra offers a Fit to Flatter look while giving you a comfortable feel. Invisible Design. Our Magic Shaping Bra Wings™ is designed to stay out of sight. No one will know you’re wearing them. Invisible offers the cover and support of a normal bra without unsightly shoulder or back straps, perfect to be worn under backless, halter or evening dresses. Durable & Reusable. You can use and re-use this bra over 30 times. Just give them a quick clean with baby wipes! Look no further for the only solution bra that will give you the PERFECT FULLER cleavage. Strong Adhesive – No Slippage. Long-lasting and sticks securely onto the body once placed on properly. After use to preserve longevity, gently wash with warm water, let air dry and the silicone wings will regenerate its adhesiveness. 100% SATISFACTION GUARANTEE Love it or return it. Our product comes with a full, 100% money-back guarantee. Just email us and you will receive a courteous and prompt refund within 24 hours. About Holly O: Holly O is a small US company owned by two best friends who are determined to empower woman around the world through fashion – one at a time. HOTTEST TRENDS—Perfect for halter, backless/strapless evening gowns, low-cut outfits and party dress. Instantly becomes a part of your body with total freedom and flexibility of movement, making you to be the absolute focus. This Great Expectations Maternity Bra brings you a stylish and comfortable option that makes it simple to nurse as needed. It has a cup fit to flatter design. The Maternity T-Shirt Bra comes in a variety of sizes and patterns so you can choose an optimal look. 2 Pack Seamless Wire-Free Comfort Maternity and Nursing Sleep Bra with Surplice neckline for easy nursing. This bra is so comfortable you will not want to take it off. Double lined front chest for added support. Loving Moments by Leading Lady Maternity Comfort wire free Nursing Bra With Full Sling . 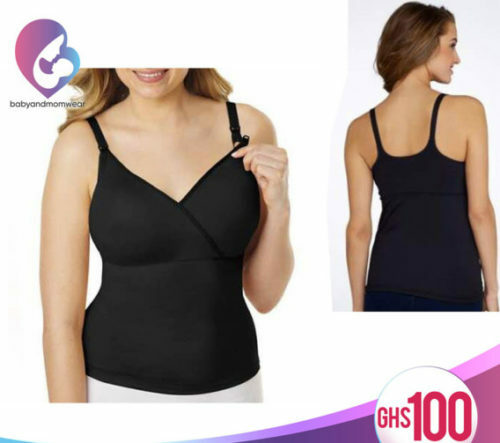 This Loving Moments by Leading Lady comfort maternity wirefree nursing cami bra with full sling offers comfortable support during your day and nursing time thanks to the easy cup access and smooth fabric.